Since it's a common problem, I have an advice article with photos on how to get mice out of the attic. I also may as well say here while you're on this page that the methods of mouse removal are the exact same as the methods for rat removal. The only difference is that mice are smaller, and actually a little easier to catch on snap traps. Other than that, all the principles are the same. And I've written WAY more about rat control than mouse control. So if you want to read any of the articles I've written about rats, all of which apply to mice, just go to my rat removal page. Thanks! I will now discuss the proper methods for mouse removal in homes, buildings, crawl spaces, attics, etc. STEP ONE - Inspect your home for the presence of mice. The first thing you may have noticed was some scratching or scurrying or pitter-patter running sounds in the attic or walls of your house. Acoustics can be tricky, so a visual inspection helps you to know what rodent you are dealing with, be it squirrels, rats, or mice. All three will leave chew marks and nesting material, but mouse trails are very small and skinny. The best bet is if you can identify mouse poop, so click the link to look at photos. STEP TWO - Once you know what the animal is, in this case a mouse or mice, comes the most important step. Inspect your entire outside house or building, and find all the open holes and gaps that mice are using to get into the structure. This can include vents, eave gaps, roof lines, loose siding, areas where pipes enter home, AC chase, etc. ANYWHERE. Any small hole or gap. Check from the ground up, and definitely the entire roof. You need to look for VERY SMALL areas, like a quarter of an inch, or a hole the size of a dime. It takes great attention to detail. Whenever you find one of these areas, seal it up by tacking in steel mesh. I also use a sealant to hold it in and block air flow. You will never remove all the mice unless you can first stop them from getting inside the building in the first place. STEP THREE - Once the place is all sealed up, it's time to trap and remove the mice. There are many tpes of mousetrap out there, but after testing dozens of kinds over the years, I have learned that the original Victor brand wooden snap traps are the best. But if there is some other kind of trap you like, go ahead and use it. The most important thing is the placement of the traps. You need to set them on the mouse runways and trails where you can see the mice are running. Look for the mouse feces. I set many traps, usually at least 12 in an attic, and more if it looks like a heavy mouse infestation. STEP FOUR - Monitor the situation. Check the traps for new captures, and listen for more scratching or running noises in the ceiling or walls. Look for new and fresh mouse droppings. If all of these stop, your problem is solved. If it continues after just a few days, you need to go back and seal the home again, looking more carefully. Seriously, it's very hard work, and you probably won't get it right on the first try, if ever. You may want to call in a professional who is very experienced, and knows what to look for, and how to seal it properly. STEP FIVE - Clean up the crawl space afterward. You want to remove all of the droppings and soiled insulation. This is for health reasons, and to get rid of the scent of mice, which can actually attract new mice to try to chew into your house in the future. Learn more about the attic cleanup process, including methods and products, in my attic cleanup page. MOUSE BIOLOGY: The House Mouse (Mus musculus) is a common rodent pest inside people's homes. They are usually around three inches long and weigh less than an ounce. They're quite a bit smaller than rats. They can have up to a dozen litters per year, and up to a dozen baby mice per litter. That's gross! Average litter size is closer to six. They rarely live longer than a year in the wild. Mice have excellent hearing and sense of smell, but poor eyesight. They often travel via urine or pheromone pathways. They have excellent speed and balance, and can easily climb most surfaces. Because they are so small, mice can fit through very tiny holes and gaps in building architecture. I mean, like 3/8 inch gaps, and holes the size of a dime! If they can get their tiny skulls through, the rest of the body slides through like putty. CAN'T I JUST USE MOUSE POISON? No no no! Poison will never kill all the mice, and it's only a temporary attempt at a solution - once you kill a few mice, new ones will just come and take their place. They reproduce very quickly, and space or food supplies will dictate populations. Plus, the use of poisons will frequently mean dead and smelly mice in the attic or walls. Poison is a cruel thing to do as well, as the death is slow and painful. But most importantly, it does not work. The only thing that works is closing off the mouse entry holes. Sometimes mice will occur in unusually high numbers, in what people call a rodent infestation, but even in this case, especially in this case, do not use poison. CAN'T I JUST USE A REPELLENT? The most common form of "repellent" used is mothballs, which does not work well, but many other deterrent devices have been developed and marketed. High-frequency sound machines, strobing lights, various odors, ammonia, coyote urine, peppermint etc. Unfortunately, none of these gimmicks work well. I've often trapped mice right next to operating ultrasonic sound machines, just to prove how useless they are, and I've actually used moth balls and peppermint as bait, and it worked! This was just to prove that mice don't care about these things. 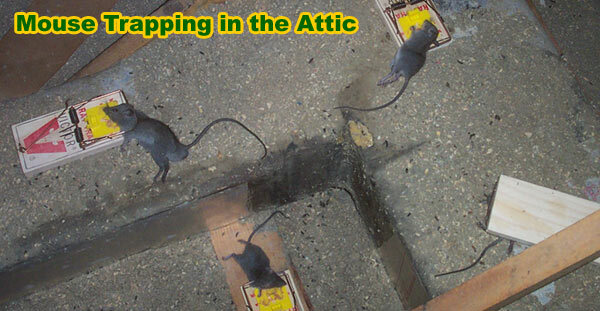 A repellent won't make a mouse leave, because if a mouse leaves a safe attic, it is guaranteed to quickly die outside, due to lack of shelter, competition from other mice, or vulnerability to predators. So in a life or death scenario, no mouse will ever get chased out by a repellent. This is why there is no kind of repellent, not a device, chemical, or natural mouse repellent. The only way to take care of a mouse problem, is to stop the rodents from getting into the house in the first place! Then you can trap and remove them. 1.) how long do I wait for him to trigger a snap trap? I think he's pretty hungry since I took out any potential for food for him out of the garage. 2.) should I move my cars out of the garage for fear of him gnawing at the hoses/wires? 3.) do you think I can "flush" him out...remove all cars, boxes, stuff, places for him to hide and chase him out of the garage? 4.) can they gnaw through metal pipes? I still don't know where he is getting his water source? 5.) any other ideas/suggestions? Borrow my neighbors cat? Thanks for your help. My Response: That's very strange. If a mouse wants to get out, it can get out. Why not leave the garage door open for a few minutes? How do you know it's still there? I'll answer your questions though. 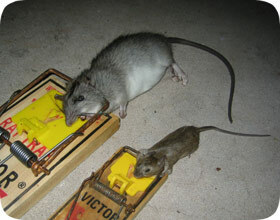 1 - Usually a mouse will get caught on a snap trap on the first night, but sometimes it takes a few nights. 2 - If you move the cars out, you might be moving them out to an area with even MORE mice. 3 - Yes, if you remove the clutter, that helps a lot. 4 - Mice can gnaw through a lot, but they usually don't gnaw through metal pipes. 5 - A cat probably won't help, because mice are so good at hiding in tight spots, but in this strange case, you could try. Can't hurt. Reader: Don't know if he wants to get out now that he has a warm place to live. I still see his poop and pee that he leaves every night. I actually saw him face to face as I was surveying the damage he is doing to stuff inside my garage. I am contemplating on trying to "flush" him out by moving all my boxes out so he has nowhere to hide. What do think about that option? Or should I just buy more snap traps? Or borrow a cat? My Response: I guess you could try to borrow a cat, but that doesn't always work. Sounds like your current snap traps aren't working. Maybe a live cage trap?